These are my daughters, Zoe and Irene. 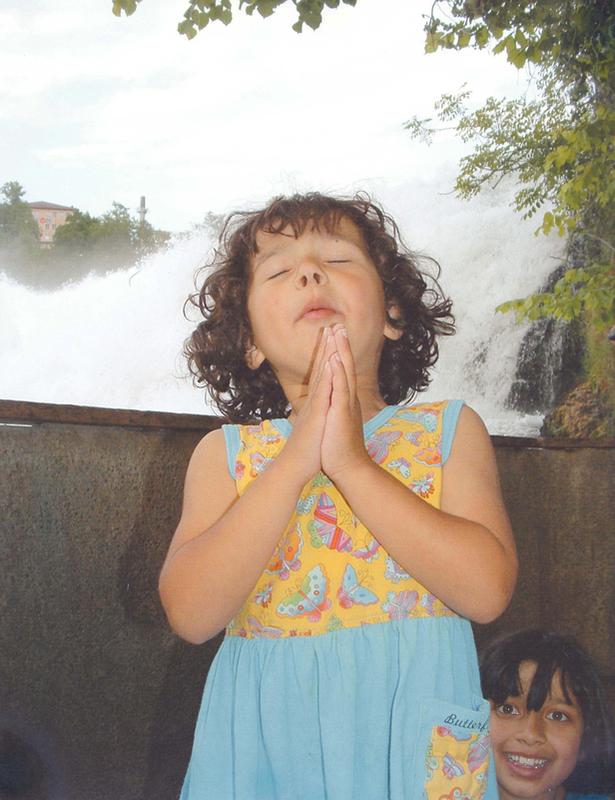 Irene, just 4, spontaneously started praying and thanking God for the Rhine Falls in Switzerland, seen in the background. She then realized that we were photographing her, but continued unfazed, with, however, the tiniest smile on her face. “She is praying as the hypocrites do,” Roy said, but I think God smiled too. That’s really scary. If we are righteous merely to be seen by other, we will have no reward from our Father in heaven. I would say that the key word, the key principle, of the Sermon on the Mount is faith. Should we be good to receive praise from men, or be quietly good, and receive a reward from our Father in heaven? Praise from men is immediate and gratifying. To believe that we will receive a reward from our heavenly father takes faith. Will it be now? Or later? What form will it take? Personally, I would love to receive a reward from my heavenly Father, both in this life, and in the life to come. And I am cool with any reward he gives me—whether the practical desires of my heart (travel, sufficient money, health, success in my work, an increasingly happy marriage, successful and Christian children) or more importantly, his spiritual gifts—joy, peace, love, contentment. And the former are worth little without the latter. 2 “So when you give to the needy, do not announce it with trumpets, as the hypocrites do in the synagogues and on the streets, to be honoured by others. Truly I tell you, they have received their reward in full. You’ve fooled people into thinking you are the real deal, and have got your reward from them in terms of their good opinion (in full). You do not get the exponential blessings of the Father in this life, or later. Again, the demand of faith. Be generous, but don’t let a soul know what you have done. Nobody will be impressed with you. Hypocrite, play-actor, like the Greek actors who put a mask over their face when they were acting. Don’t be a prayer-meeting bore. Don’t be a hypocrite. Don’t stand up and bore everyone with long-winded prayers, losing tracking of your audience in your display of your own compassion and wisdom. Don’t pray to be seen and to impress. Don’t worry about the impression you create when you pray. In fact, don’t pray in public without putting your prayers through the sieve of strict honesty. Are you addressing God or impressing your audience? Will you have a reward? Will people be impressed with you? Yeah. You’ll have your reward, such as it is, in full. However, these prayers will never make it to your heavenly Father. But then perhaps they were not intended to! You do it in secret, when there are hundreds of lucrative, pleasurable, career-boosting things you could be doing instead of praying. But God sees and values the time you have spent with him, and if, we choose to pray, in secret, he will give us a reward. A reward!! From God!! That’s truly exciting. Whatever he may choose to give us. Blessed is the one whom GOD rewards. Let your prayers be short, brief, and to the point, since you are speaking to someone who knows your needs anyway. May your name be revered. Let us see your beautiful kingdom in our lives, and in the world around us. Help me to do your will. And may it be done on earth as it is in your heaven. Wipe our sins off your books, as we wipe the sins of those who sin against us off our books. Protect us from temptation, for you know how weak we are. Temptation can also be translated as testing or trials. And in particular, deliver us from the power of the evil one. Here’s a longer blog post I did on The Lord’s Prayer. If we do not write off other people’s weakness, treachery, and perfidy, our Father will also hold our sins against us. And then, who would stand? Live under the eyes of God. Do things to be seen only by God. Be rewarded by God. Elsewhere Jesus says,“Do not work for food which perishes, but for food which endures to eternal life.” We often have a choice as to whether we will spend our energy on things which will bring us more money, or things which will be rewarded in heaven (prayer and giving, for instance). Do not pile up money, for there is a risk that your heart will be where your money is. Do not make your money your treasure. It can be lost. Break your focus on your bank balance. How? I ask the Holy Spirit to come and flood my heart and mind and spirit when I find myself thinking too much about money—how much I have, how much I should have, how much I have coming in, how to make more. Store nothing? That’s one way to live. I don’t have the stomach for that. At present, when I find money entering my thoughts over-much I pray for the Spirit to invade my mind instead. If it becomes a serious problem, there is nothing like increasing one’s giving to break the hold of money on your mind. Store up treasures—of love, of goodness, of good deeds—in heaven. Your emotional life and love and desires will inevitably be caught up with what you treasure, whether it’s your bank balance or your God. Or success, or your blog or your writing or social/churchly success or the idol du jour. 22 “The eye is the lamp of the body. If your eyes are healthy,your whole body will be full of light. 23 But if your eyes are unhealthy,your whole body will be full of darkness. If then the light within you is darkness, how great is that darkness! If you focus on glorious things, your whole being will be suffused by light. If you focus on unhealthy things, your soul, your spirit, will be in darkness. Oh no!! Focus on the light instead. This takes a deliberate effort—a deliberate flipping out of the tape, and replacing it. Serve, douleo, implies the work of a slave. A slave can only belong to one master. We cannot love two things with all our hearts, with all our minds, and with all our spirits. So we have to choose. It’s either God—or money. Or all the things which come under the dominion of the devouring God Mammon—success, fame, wealth, reputation. Oh Lord, Lord, Lord, let it be you. First of all, you are lovely, and you can fill my spirit with joy. Secondly, you can give me all the money I need, but money cannot give me as much of you as I need! Or any of you!